This luxuriously finished Italian villa lies in a private, gated estate at the foot of Cortona, offering great accommodation as well as privacy and security. 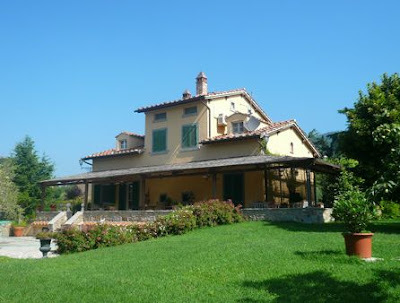 It is one of four villas constructed on land owned by the nearby Villa del Vescovo ("Bishop's Villa") and the interior completion was overseen by the present owner. His profession as an antique dealer is evident in the materials used in the house, such as the seventeenth century front door and ancient stone fireplace in the living room. The ground floor is open plan, with entrance hall, living room with fireplace, dining room and well equipped kitchen. There is also a double bedroom complete with marble-walled ensuite bathroom. Both the bedroom and kitchen have double French doors opening out onto the covered terrace at the back of the house. The first floor is effectively one large bedroom suite with four-poster bed and fireplace, large mezzanine gallery presently used as an office, walk-in wardrobe and a fantastic bathroom. The bathroom contains Jacuzzi, large walk-in shower, double sinks set below thick marble and wall to wall mirrors which have a great effect. The basement floor contains a separate suite with large living room and fireplace, double bedroom and attractive bathroom. From this suite there is access to the garage and other store rooms that could potentially be converted to further accommodation. The south facing side of the house has a large covered terrace with two dining tables, overlooking a large paved terrace; all of which is ideal for summer dining and entertaining. In all there are 1,500m2 of beautifully tended gardens surrounding the house. There is a swimming pool set just off to one side of the garden, which is owned communally by the four villas, but which to all intents and purposes feels like part of this house. A beautifully appointed villa in an exclusive residential estate, enjoying country views but also very close proximity to shops, bars and the beautiful town of Cortona.